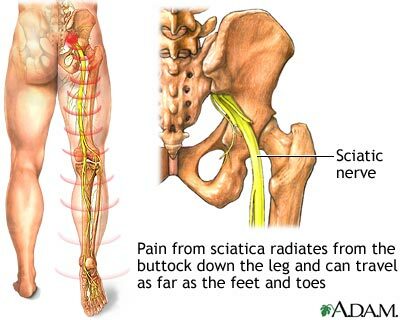 Anyone who’s had sciatica knows that it isn’t a little problem. It can be horribly painful and make it difficult to get around and to sleep! What you probably don’t know is that there are different causes of sciatica. As mentioned, sometimes it’s positional. For example, you are out of place possibly in the low back/hip or there are disc issues and pressure is put on the large sciatic nerve. It is a large nerve in circumference so that’s part of the reason the pain is so great. So seeing a chiropractor might help but if it doesn’t, then you may have another reason for the sciatica to be present. If it’s a disc issue, there are possible ways to rehab the disc but not all chiropractors do this. You may need to seek out a Pettibon trained chiropractor. I’m sure there are others out there who specialize in this area too. The other cause can be a chemicals built up in the nerve or acids like lactic acid. We often see this as a cause and we must use a high dose of nutraceutical Thiamine (B1) to get rid of it. There is a specific way this is done once we know that this is the root cause of the sciatica. Other possibilities are poor carbohydrate metabolism and dehydration but as I said, we mostly see the acid build up or a positional issue. So there is hope but typically the chemical/acid problem is not addressed and people go on suffering without an answer in sight. For more info, email us at cchs@shaw.ca.